Welcome to CJCN and thank you for visiting. 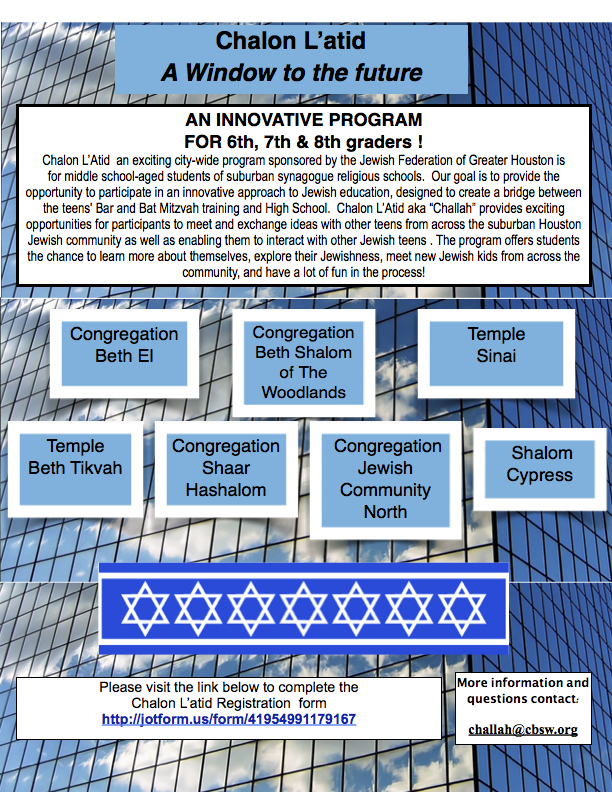 Congregation Jewish Community North is a warm, welcoming oasis of Judaism in northwest Harris County. We are a diverse congregation whose membership encompasses all levels of observance. Our members come from Orthodox, Conservative, and Reform Jewish backgrounds. We have many interfaith families, as well as many Jews by choice. We always welcome members and non-members, Jews and non-Jews alike. We feel we have a lot to offer at CJCN, from weekly Shabbat services to our Jacque C. Shure Religious School, a vibrant Sisterhood and Men’s Club, various special interest groups, adult education programs, and community-wide gatherings throughout the year for Passover, Purim, Hanukkah, and more. If you would like to learn more about us, please feel free to explore our website further or go ahead and make a more human, more personal connection by calling us to set up a time to come by and visit. I am sure that you will be glad you did. Feel free to email me at president@cjcn.org and I will be glad to personally answer any questions you may have. I hope to hear from you soon. SPRIFTY is a part of the Union of Reform Judaism’s North American Federation of Temple Youth. On the outside, SPRIFTY stands for Spring Federation of Temple Youth which is composed of high school students in 9th through 12th grades. SPRIFTY truly is Congregation Jewish Community North’s high energy and creative group of teens. Together, we not only attend Temple programs, but also create and hold events of our own. We are organized just like the Sisterhood, Men’s Club, or any other group in the Temple would be- by electing our own student board to discuss, plan, and lead programs. Within each program, our board is conscious to include SPRIFTY’s three pillars: community service, the social aspect, and Judaism. On a wider scale, SPRIFTY gets together with 27 other local youth groups from all of Texas and Oklahoma four times a year on what is called “Kallahs” or “Conclaves” to create NFTY-TOR (North American Federation of Temple Youth- Texas and Oklahoma Region)- the regional youth group. On the inside, SPRIFTY is a tight-knit group of friends. Together, we enjoy participating in regular community service projects and our own services simply because we are in each other’s company. Some of our regular events include: Interfaith Hospitality Network, Mitzvah’s of the Month concentrated on improving the Temple, Jewish Holiday related programs, Shabbats and Havdallahs held in our own homes, and lock-ins intended for pure fun. One can expect each and every one of these events to be themed and packed with teens taking part. SPRIFTY is always open to new members who are looking to find their personal Judaism, a good time, and friends that will last a lifetime. SPRIFTY is a live example of a successful youth led group- something hard to believe, but easy to see flowing anywhere in CJCN.